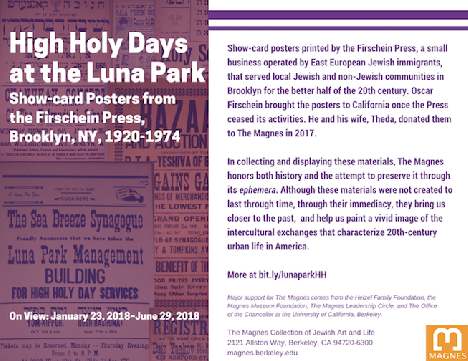 This exhibition presents a selection from the over one hundred show-card posters printed by the Firschein Press, a small business operated by East European Jewish immigrants, that served local Jewish and non-Jewish communities in Brooklyn for the better half of the 20th century. Oscar Firschein brought the posters to California once the Press ceased its activities. He and his wife, Theda, donated them to The Magnes in 2017. In collecting and displaying these materials, The Magnes honors both history and the attempt to preserve it through its ephemera. Although these materials were not created to last through time, through their immediacy, they bring us closer to the past, and help us paint a vivid image of the intercultural exchanges that characterize 20th-century urban life in America.